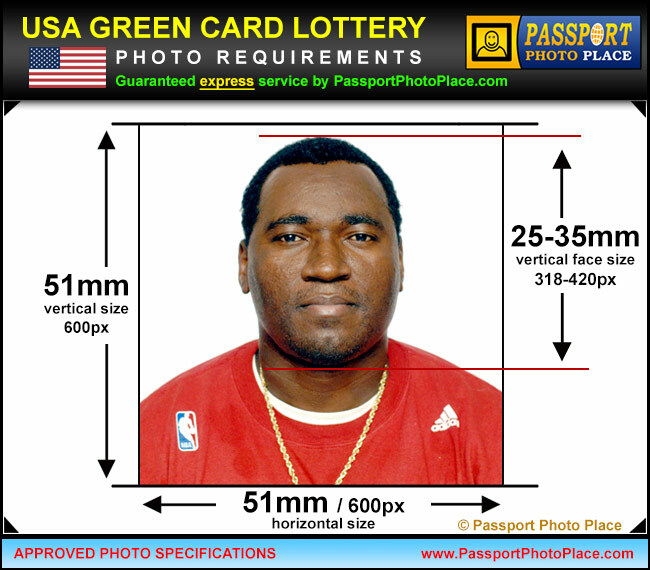 2021 green card lottery digital photo services are now processed at Passport Photo Place in Orlando, FL. For photo session appointment email or call our Orlando, FL Orange County photo studio at 321-236-1105. We are a professional photo studio that specializes in DV visa green card lottery photo services. We adhere to the strict photo requirements established by the United States Department of State and guarantee acceptance of the digital photo file at the time of application submission and application review after the photo has been uploaded. Guaranteed acceptance. No silent application rejects! 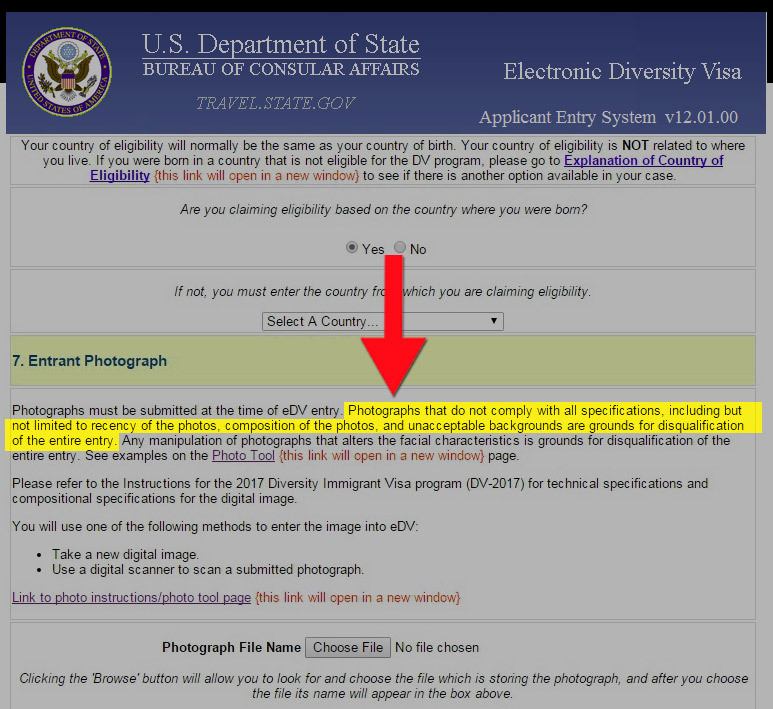 Did you know that if the DV Visa lottery photo is not properly taken it can still pass the online photo validator? This is because the online photo validator only checks for the photo dimensions and the file size but the photo biometrics and other photo specifications are not actually verified! This means that DV Visa lottery applications that contained improperly taken photos and were accepted by the online photo validator could be silently disqualified and the rejected participants would not receive rejection notices. This can happen year-after-year without success. We take guaranteed DV lottery pictures and generate properly formatted digital photo files within 15 minutes. The photo service is provided by a professional legal document photographer on premises. 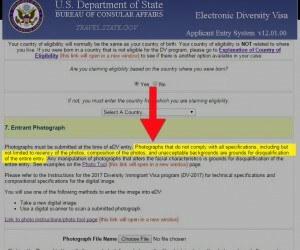 US Government recommends to use a professional photo studio service to avoid Diversity Visa lottery application rejection. The photos are provided in a digital file format and each photo is instantly validated at the time of the photo session. We optionally offer a full assistance and guidance with the US Diversity Visa Lottery applications. At additional fee, we will help you to properly fill out the application, verify all information and submit it to the Bureau of Consular Affairs electronically at the time of photo session. Please wear a solid-colored top/shirt that is not white. White tops/shirts are not acceptable since the background color for US Diversity visa lottery photograph is white. If you need to wear prescription glasses, ensure that the glass is not tinted and clear. 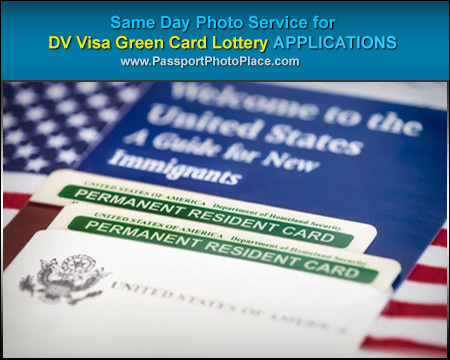 Important information regarding Diversity Visa Green Card Lottery online photo validator tool. (!) It is absolutely imperative to understand how the online validator tool works as it is provided by the Bureau of Consular Affairs, U.S. Department of State. The digital picture files uploaded along with the Green Card Lottery applications require a preliminary verification. For this purpose, an online validator tool can be used to verify specific picture requirements before submitting your application. Therefore it is important to note that as long as the photo is 600×600 pixels in size and under 240kb, it will pass the online validator tool, however, the DV visa lottery application will be silently disqualified without an applicant notification. At Passport Photo Place we guarantee that each photo meets the strict photo specification requirements as provided by the Bureau of Consular Affairs, U.S. Department of State. Our Orlando, FL Orange County photo studio is accessible via major routes and in relatively close proximity from the following cities: Aloma, Altamonte Springs FL, Apopka FL, Apopka, Azalea Park, Belle Isle, Bithlo, Buena Ventura Lakes, Cambell, Casselberry, Casselbery, Celebration Florida, Celebration, Christmas FL, Christmas, Chuluota, Clermont, Cloud FL, Cocoa Beach, Cocoa FL, Cocoa, Conway, Davenport, Doctor Phillips, Eatonville, Edgewood, Fairview Shores, Fairvilla, Fern Park, Forest City, Goldenrod, Gotha, Hiawassee, Holden Heights FL, Hunters Creek, Kissimmee, Lake Buena Vista, Lake Butler, Lakeland, Lockhard, Lockhart, Longwood FL, Maitland, Meadow Woods, Merritt Island and Cocoa Beach, Mims, Narcoossee, Oak Ridge FL, Oakland, Ocoee, Orlando FL, Orlando Florida, Orlando International Airport, Orlando, Orlo vista, Orlovista, Oviedo Florida, Oviedo, Paradise Heights FL, Pine Castle, Pine Hills, Port Saint John, Rosemont FL, Sanford, Sky Lake, South Apopka, St. Cloud, Tildenville, Titusville FL, Titusville, Union Park, University Park FL, Windermere FL, Windermere, Winter Garden FL, Winter Park and Winter Springs.